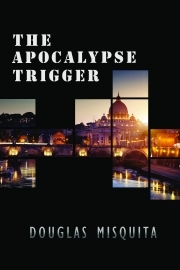 Description of "The Apocalypse Trigger"
A devastating terror strike on the world's grandest luxury hotel has the globe clamoring for the head of the mastermind, Sebastian Laporte. Douglas Misquita is a thriller writer from Mumbai, India. His books Secret of the Scribe and Haunted have been enthusiastically received by fans of the action-adventure thriller genres. He has also penned a travelogue, Impressions of Egypt and an action-short, Know Thy Enemy – the prelude to The Apocalypse Trigger – available as a free download from his website. Reviews of "The Apocalypse Trigger"